An oiran playing with her(?) child. They are both dressed for winter. 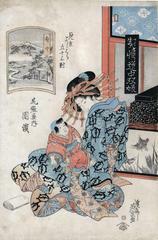 The woman's kimono is covered with stylized turtles. The decoration on her hairpins may be a symbol of the house she works for. That floral motif is repeated twice on the child's robe. It also appears on the black lacquer box behind her and on the decoration of the blue and white sliding door above it. The butterflies and grasses shown on the screen below the shelf with the box may be an indication of warmer times to come. The colors used in the oiran's robes are considerably different than those of the prints in Boston and Chiba. This could be due to the use of different inks or from fading. There are 48 prints from this series in the National Diet Library. Illustrated in color in 浮世絵師溪斎英泉, 千葉市美術館 (Keisai Eisen: Artist of the Floating World, Chiba City Museum, 2012, #236, p. 196.